Naughty Mr Rothschild. Was he caught in the act? It was often a fine line that financiers and bankers trod in their dealings. The Rothschilds appear to have walked that line in their bullion dealing with both the English and French governments paying special attention to them during the Napoleonic wars. But as the story below shows, bankers like the Rothschilds were men of influence. 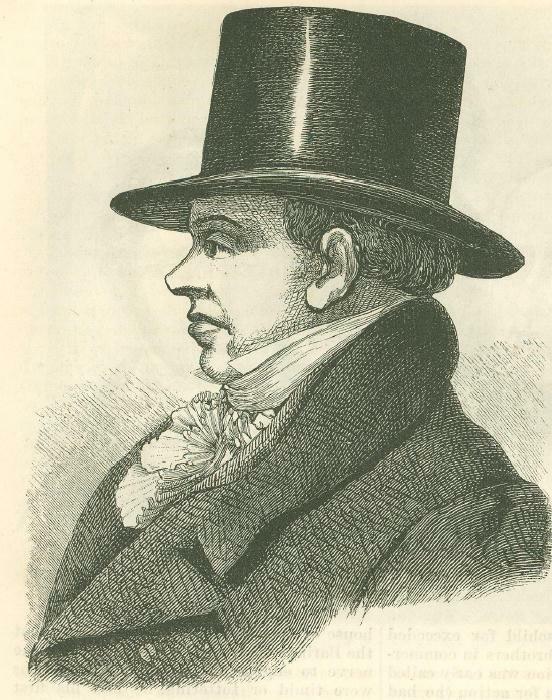 In France, James Rothschild had come under the critical eye of the authorities who suspected him of smuggling bullion and guineas even though Napoleon had given his people a limited consent to work with English smugglers. He built the famous ‘Ville des Smoglers’ (City of Smugglers) just outside Gravelines and on a much smaller scale permitted a very small number of smugglers to live and operate out of Dunkirk. The movement of smugglers was strictly controlled by the French involving six ministries: interior, war, navy, finance, police and manufactures. Free traders had to sail a complex course through paperwork and were usually confined to a guarded enclosure involving security passes for any French citizen entering the English quarter. Similarly, the English government in need of support, recognised that smugglers were far better equipped to ship and supply certain cargoes while bankers like Rothschild had developed a robust network to deliver gold bullion to key cities in Europe and further afield, St Petersburg. The French encouraged English smugglers because they disrupted the British economy. Looking through the estimated amounts of smuggled goods into England gives some idea of the scale and range: large amounts of lace, silk shawls, bonnets, ribbons, leather gloves, brandy and Dutch gin all found their way into the country through well-organised enterprises like the Seasalter Company. The following story appeared on Tuesday 4 June 1883, and we see how even the most influential banker in Britain could become entangled in a seizure of contraband by Customs and Excise. Extensive seizure of French Silks and Lace. – A few days since the officers of his Majesty’s Customs made a seizure of 36 packages, 18 of silks and the remainder in lace, of considerable value, on board the Sir William Curtis, belonging to N.M. Rothschild, Esq. in the St. Katherine’s Dock. 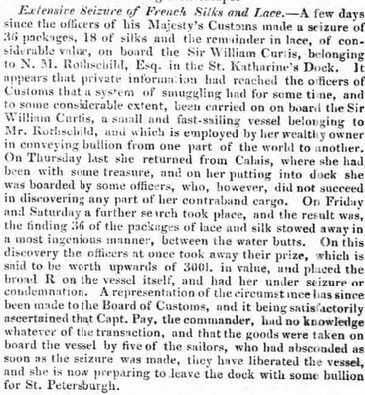 It appears that private information had reached the officers of Customs that a system of smuggling had for some time, and to some considerable extent, been carried on on board the Sir William Curtis, a small and fast-sailing vessel belonging to Mr Rothschild, and which is employed by her wealthy owner in conveying bullion from one part of the world to another. On Thursday last she returned from Calais, where she had been with some treasure, and on putting into dock she was boarded by some officers, who, however, did not succeed in discovering any part of her contraband cargo. On Friday and Saturday a further search took place, and result was, the finding of 36 of the packages of lace and silk stowed away in a most ingenious manner, between the water butts. On this discovery the officers at once took away their prize, which is said to be worth upwards of £300 in value, and placed the broad ‘R’ on the vessel itself, and had her under seizure or condemnation. A representation of the circumstances has since been made to the Board of Customs, and it being satisfactorily ascertained that Capt. Pay, the commander, had no knowledge whatever of the transaction, and that the goods were taken on board the vessel by five of the sailors, who had absconded as soon as the seizure was made, they have liberated the vessel, and she is now preparing to leave the dock with some bullion for St. Petersburgh. Did Nathan Rothschild know? Did he even care? Probably not. In the grand scheme, smuggling on this small scale would have made no sense. The customs officers earned a handsome £300 reward for their work representing a percentage of the cargo’s value possibly eight per cent. But no cargo could compare with gold bullion and the business of guinea trading with Europe. As an illustration, Nathan Rothschild sent over 400,000 guineas to one of his French agents, Morels, between February and November 1811. And that was just one agent! The loss of the vessel was serious, however. It had been specially designed for bullion shipments so an explanation was needed that would distance the owners and present them as an innocent party. (It is surprising that this ploy worked. Many other innocent owners were not so lucky.) The contraband is therefore attributed to five unknown sailors who were working on the boat and who conveniently disappear. The cargo is extremely well hidden and it is incredible that neither the Captain nor Nathan Rothschild had any knowledge of these goings on. We also have the hint of a rival, perhaps an envious competitor, being involved in the discovery. A reference to ‘private information’ suggests an informer, but we need to remember that Nathan Rothschild had friends in high places, men of influence who depended on him. The vessel had been specially built for speed and to carry bullion abroad to cities like St Petersburgh. It needed to be fast in order to meet deadlines and out-pace other vessels when necessary. It also needed to be unobtrusive so that it could slip in and out of port without raising too much attention. The military paymasters who were responsible for ensuring that the Duke of Wellington’s army were paid could not lose such a vessel. Neither could Nathan lose his reputation on such an insignificant smuggling consignment. The fine line of remaining on the right side of the law was a tension that everyone lived with and where the financial jugglers of gold bullion worked their particular skills and trade. In many respects it was an uneasy alliance especially between the years 1809 and 1810. What we have at this time is a conjuncture of financial, economic, and military factors that convince Napoleon and the English authorities, smugglers could serve their pressing interests in special ways. What occurs is a circular flow of contraband goods, gold, and people between England and France, with Kent and Sussex on one side of the Channel, and Dunkirk and Gravelines, key staging points or gateways for this traffic. A delivery of 36 packages of French silk and lace was not going to jeopardize that. For another mini portrait of Nathan Rothschild and how his banking empire stretched across Europe, read: Trading in dark pools. The strange life of a Georgian bullion banker.